The mission of Delaware Canal 21, a not-for-profit, community-based group formed in 2012, is to identify and secure new public and private resources to help the state park system provide the vastly improved levels of planning and major maintenance the Delaware Canal and its recreational towpath need and deserve. When the Canal is watered and the towpath is well-maintained, the park’s stunning beauty increases local property values and provides significant economic and environmental benefits to the region. Residents and visitors alike enjoy walking, running, bicycling, and cross-country skiing on the towpath, and fishing, canoeing, and ice skating on the Canal. Over 2.4 million people visited the Delaware Canal State Park from 2013 through the first half of 2015, spending an estimated $10,131,000! (State Park tallies; 2012 Penn State Department of Recreation, Park and Tourism Management Study). However, Delaware Canal State Park is the most complex of the 121 state parks in Pennsylvania. Because of perennial constraints on the state’s budget, the Canal suffers from barely adequate day-to-day maintenance, minimal planned or preventive maintenance, and no planned capital maintenance. As a result, it is suffering from deterioration and overgrowth. The Canal rarely is fully watered — and without water it is not a canal but a ditch. After river floods — of which we’ve have 4 major ones in the last 10 years, with many more to come — miles of the recreation path and the Canal are unusable literally for years before being repaired. Since our formation in 2012, Delaware Canal 21 has already taken the lead in planning and implementing a system of backup pumps. 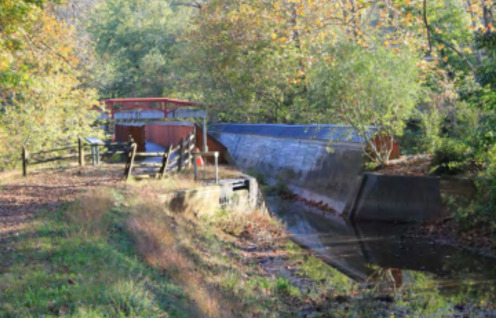 Our plan, supported by the Delaware Canal State Park Advisory Board and the Pennsylvania Department of Conservation & Natural Resources (DCNR), is to install a system of backup pumps located up and down the length of the Canal. That way, when water flow is interrupted from the north, a backup pump immediately below the area needing repair can be activated, bringing water in from the Delaware River to the sections below. We have had success in bringing together state park staff with the Army Corps of Engineers to inventory the river walls and assess the need for repairs. Secured a $225,000 Wm. Penn Foundation grant to create a Visioning Study (together with partner Delaware & Lehigh State and National Heritage Corridor). This study generated a detailed list of priority projects that are needed to increase public access, reduce flooding, and greatly improve maintenance practices. Click here to see results of the Vision Study. We will assess a variety of innovative funding ideas that came from the Visioning Study, which can help us work towards partial Canal self-sufficiency. Obtained a $150,000 Storm Water Grant from the Wm. Penn Foundation and DCNR (together with partner Heritage Conservancy) to devise ways of mitigating storm water damage to the Canal and recreation path. Successfully advocated to shape DCNR’s June 2015 Delaware Canal State Park Plan to ensure the report included goals relating to preventive maintenance, long-range planning, mitigation of river flooding and storm water damage, and keeping alive the concept of daylighting the Canal’s buried southern sections. “The Delaware Canal can be a world-class destination for walking and biking." Built in 1832, the Delaware Canal has a long history rooted in the Industrial Revolution. It is now the only remaining continuously intact canal of the great towpath canal building era of the early to mid-19th century in the United States. Want to help? Either give a general donation or donate specifically to our latest project.